With the emergence of outdoor living, unique deck options are becoming must-haves for many Milwaukee area homeowners. Decks are an extension of your home, so it is important that your deck showcases style with custom design and detailed craftsmanship. There are endless options for a deck. Let’s take a look at some of the more popular deck options that we have been implementing on many of our Milwaukee area decks. A pergola provides overhead shade while also adding personality to your deck. The pergola is usually only above a small portion of the deck. A common sized pergola is 12′ x 12′ and we add lots of detail in the rafter tails. This sized deck pergola in cedar will add about $4500 to the total deck cost. Diagonal decking is when deck-boards are installed at a 45-degree angle across the joists. This technique is done mostly for looks but it also increases the strength of the deck. When decking is installed diagonally, joist are installed every 12″ instead of the usual 16″. There is also more detailed cutting required for the technical decking design. Diagonal decking can increase the overall cost of the deck by about 10%. We build more and more built-in benches for decks every year. Benches especially work well for materials like composite decking. Built-in decks give a seamless look to your deck furniture. Sometimes regular deck furniture sliding on deck-boards can create scratch marks on your deck. These mishaps are eliminated with built-in deck benches. Decks no longer have to be only square. We have built many octagon or even rounded decks. Unique shaped decks really standout from simple decks. Oftentimes we build unique shaped decks that are multi-leveled to add even more flair to your deck design. Create the perfect evening ambiance to set the mood with deck lights. After you have invested in a new deck, you want to enjoy it as much as possible. Adding deck lights will allow you to spend time on your deck all through the night. Solar deck lights are very nice because they do not require much added expense to the deck. Decks in the past were plan and simple. But today’s decks can be as unique as you possibly desire. 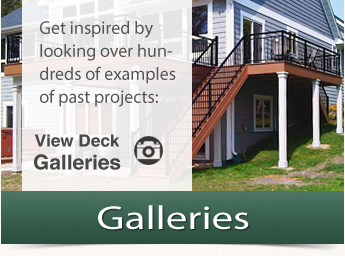 We can come up with an innovative design for your deck project. Every outstanding deck begins with an innovative deck design. And we believe that we build nothing but outstanding decks. 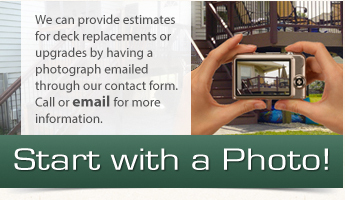 If you are in the Milwaukee, WI area, contact us today for a free deck estimate.